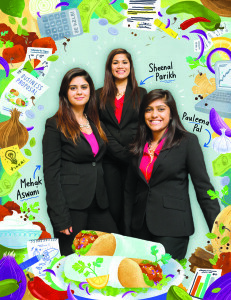 Surely Virginia Woolf was thinkinG OF peckish college students when she wrote, “One cannot expect to think well, if one has not dined well.” But for Mehak Aswani, Pauleena Pal, and Sheenal Parikh, typical brain-starved undergrads seeking food in the wee hours of the morning, fulfilling their deepest cravings near campus was out of the question. The three seniors—finance, psychology, and finance majors, respectively—were set to enter the 2015 Mayo Business Plan Competition with a concept for a social media aggregator until the idea of opening a restaurant near campus took hold. So they scrapped their original idea—two days before the deadline—and set out to solve a far different entrepreneurial problem: getting India’s classic street food, the tikka roll, into the hands of a time-pressed demographic. “Our generation needs food that can be delivered,” says Aswani, sitting in the Brower Student Center’s Lions Den one day last spring. “We have no time to eat. I’m probably going to eat this in the car,” she says, holding up a plastic takeout box encasing a sandwich on a Kaiser roll. At the finals in April, it came down to three teams vying for the princely sum of $40,000: Team Tikka; Thor Electric Longboards, which devised a mechanism to attach a motor to any longboard; and ProjectSpotter, an online platform for student researchers to find others interested in the same topic. It had been a long haul, this fourth annual competition, but worth every minute, says Lorraine Allen, regional director of the Small Business Development Center: New Jersey, based on campus. “The students learn about financials and about how they’re used and why. And they learn the art of the ask, getting information from existing businesses. After a private confab for the alumni judging panel, Eric Szabo ’97, chief risk officer for Annaly Management Company, stepped on stage to announce the winners. Taking the third-place, $6,000 prize was ProjectSpotter, leaving Thor Electric Longboards and Team Tikka to resume nail-biting. “My mother was texting me from the audience while the longboard group was presenting, making me nervous,” says Aswani. Szabo continued. “Thor Electric Longboards is our second-place, $12,000 winner,” he said. Stage right, the women of Team Tikka immediately had their arms around each other, silently hugging and doing what looked like levitating. Out came the classic gargantuan check for $22,000, which, coincidently, matches the team’s estimate for a fryer and refrigerator. The students’ passion for the business was the clincher for the judges. “You just knew they were going to do this,” says Szabo. If all goes according to plan, Tikka Roll, the restaurant, will lease space in the soon-to-open Campus Town development across the lawn from the School of Business. “We would all be thrilled to see this open,” says Bill Keep, dean of the school. 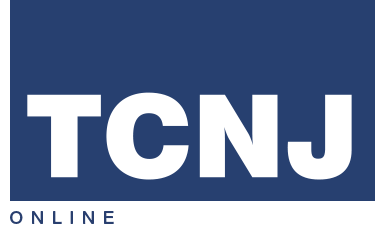 Still, Keep is less concerned whether the competition launches businesses (though he acknowledges it would be “affirming”) than with giving TCNJ students the opportunity to put “their ideas under rigorous review and quantify their ideas, something they’ll be able to use their entire careers,” he says.